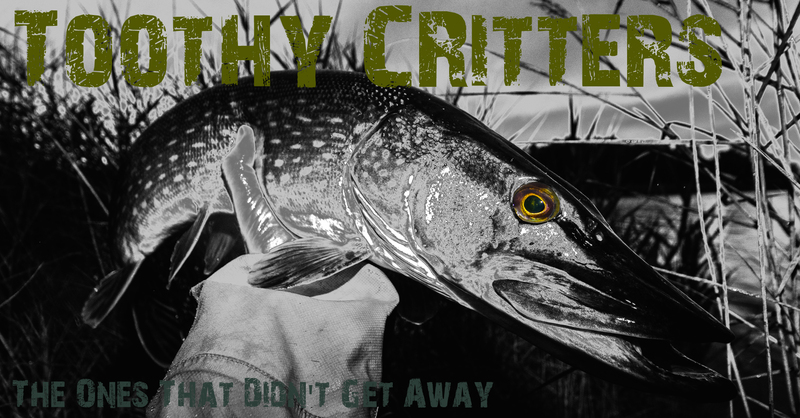 Everybody is just keen about GTs when it comes for fly fishing flats with the heavy fly fishing gear. But there is a fish who’s reputation is heavily underrated and even more fun to catch on the fly than GTs are. There is something else. Thats a message to all of you, that aim the flats with a fly rod to fish for only one specific target fish. Most people say that pound for pound this fish is even a harder fighter than the GTs are. 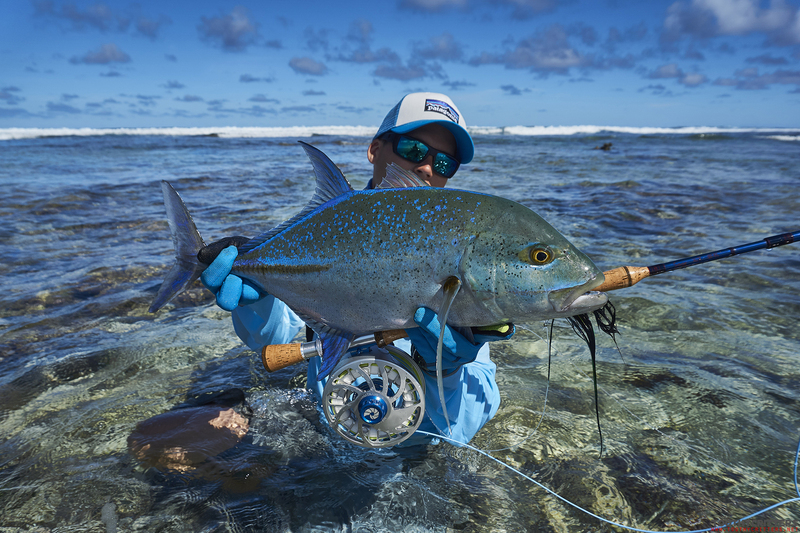 This is a bluefin trevally love story. More fun to catch? 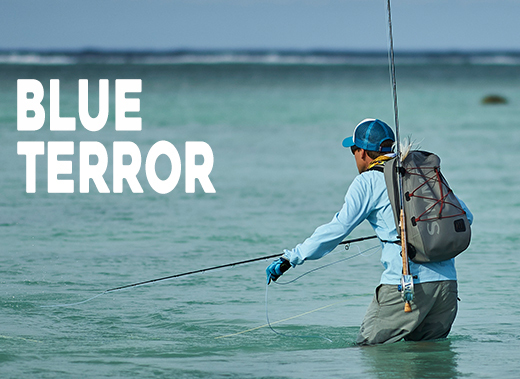 Yes, catching this blue gangsters for the flats is much more fun because they are an actively pack hunting fish. And their most pronounced attitude is distrust when it comes for prey. They will always fight for their food. Only the meanest will take fly. And it makes them a bit easier to catch. And more exciting, With a GT you can make many things wrong but with the bluefins you can do things wrong and they still will attempt on the fly. 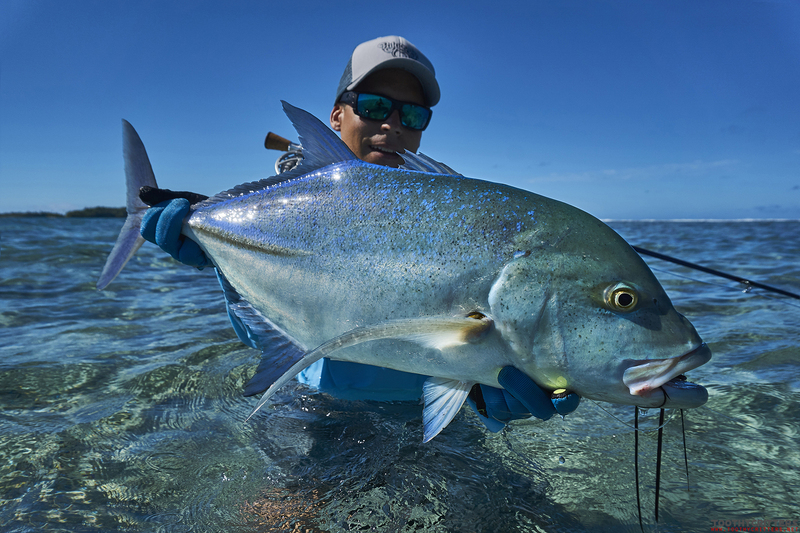 I found the bluefins much more interesting than the GT although they don’t grow that big but seeing the hungry pack fighting for my fly is spectacular in a many way. Hard and dirty fighter? They do not grow that big like GTs. In average they are much smaller but appear in higher numbers. Adults grow also pretty big and reach sizes of more than a meter and then this is a more than decent battle. But fish this size are unfortunately very rare and for sure not easy to catch. Even GTs are in this size categories!! But catching one of this beasts is for sure something you can impress your fishing buddies. Catching them is pretty simple. Heavy rod not less than 10 weight, strong reel and line and a leader not lighter than 60lbs. In reef areas not less than 100lbs. Not because of the teeth but more because of abrasion on coral. They are not leader shy. 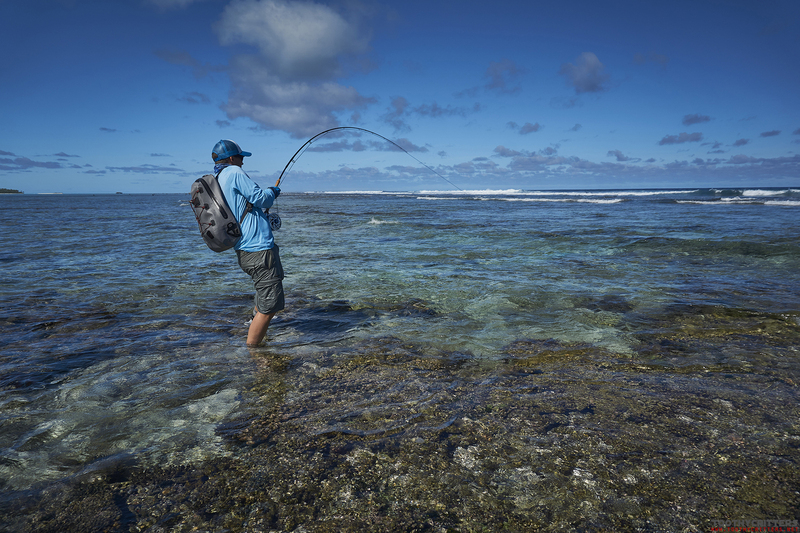 You can use your GT fly fishing gear and be prepared for GTs too. Don’t be shy in terms if fishing and fighting them. Like every other saltwater species they will show you who’s the boss on the reef. On the flat when the blue terror approaches you’re gone be fast like a lighting. The fast they appear the fast they disappear. Always searching for an innocent prey. But catching them is pretty simple. Make a cast close to the fish, mostly it will be a pack of many fish. And once the fly hits the water strip as fast as you can. Too fast is impossible. If they are interesting, and mostly the will, you will get a instant take. What happens sometimes, and this is then really frustrating, that too many fishes fight for the fly and no fish is taking it. If you feel so get the fly out before they reach you and wait a few seconds and place the fly again. There is only one thing you can do wrong beside hitting their head with the fly is that you stop stripping. No prey would do that so the trevallies will immediately spook if you stop stripping. Wear gloves! You will need them because of two reasons. First, when a fish took your fly you have to stop them, like you need for GTs too. The line will be heavily ripped through your fingers. A not watered line, like fishing from boat, will badly burn into your hand. Secondly, if you land the fish be care full grabbing the tail. The caudal peduncle has sharp scutes on it that can easily cut your palm of finger. 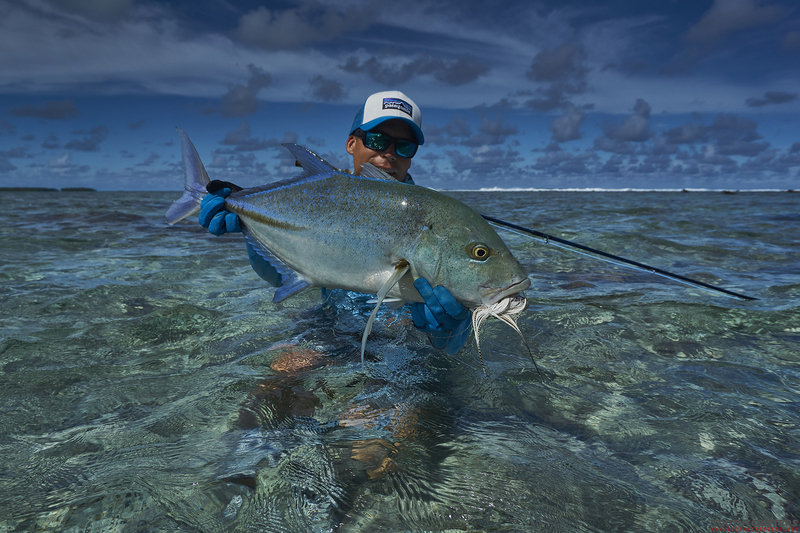 Other than GTs will a bluefin trevally not give up in your hands. GTs are easy to handle and they remain mostly calm in your hands. Bluefin trevallies won’t and shake much more often. If there is a tidal current, hold the fish face first into the current and ensure the flow of water through the gills. The flies? In general the same flies that’s being used for GTs can be also used for bluefin trevallies. If I’m fishing only for Bluefin Trevallies I’m using smaller flies (4-5inches) because it is nicer to cast and they don’t care. If GTs can be expected too I’m only using the GT setup with flies 6-8inch. Make sure your hook is very strong. Just because they are smaller doesn’t mean you don’t need ultra strong hooks. Smaller, yes, but not weaker. Colors of the flies can vary from pure black, pure white or two-colored white/chartreuse, white blue. I found pure black or white/chartreuse as for me best. So, don’t forget your 10weight rod for your next fishing trip and once you see the blue flashing in the water give it a try and make a cast. It will be worth. 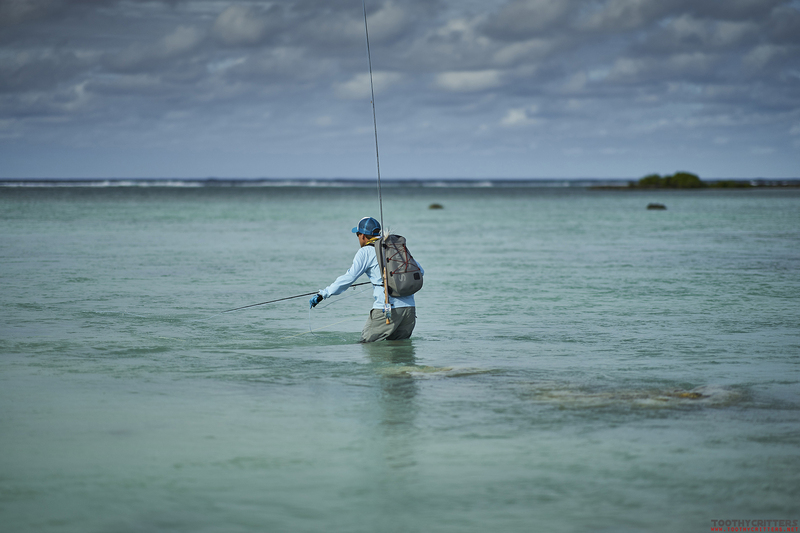 This entry was posted in Aitutaki 2017 @ Cook Islands, Blog and tagged Aitutaki, Bluefin Trevally, Bonefish, Cook Islands, Fliegenfischen, Fly fishing, Fly Fishing Europe, Giant Trevally, GT, Land based GT, Nautilus Monster, Nautilus reels, Reef fishing, RIO Fly Lines, Sage, Sage Xi3, Salt, Seychelles, Simms.